LEDGlow’s Green Wireless SMD LED Underbody Lighting Kit universally fits 126 ultra-bright green SMD LEDs housed in (2) 46” and (2) 36” underbody tubes to any car! LEDGlow’s new and improved Green Wireless SMD LED Underbody Lighting Kit universally fits 126 ultra-bright, wide angle SMD LEDs housed in (2) 46” and (2) 36” underbody tubes to any car. Featuring a flat mount tube design with 15 degree angled mounting brackets that take up less space than the previous model, this revamped underbody lighting kit produces a much brighter and stronger color spill that surrounds the bottom of the vehicle for a custom, head turning look! The included control box features (12) unique lighting patterns, (5) sound activation modes and a solid color illumination mode. Each lighting pattern is easily selected using the included 4 button wireless remote or by using the corresponding buttons located directly on the control box. The included music sensor plugs into the side of the control box and allows the underbody lights to flash to the beat of the music playing inside of your car! The control box will also remember the last mode the underbody kit was set to prior to your vehicle being powered off. Each underbody lighting tube features 13' of power wire, with the exception of the rear 36" tube that features 18' of power wire. This allows you to have more than enough wiring to route the power wires to the engine bay where the underbody junction cable will be mounted. 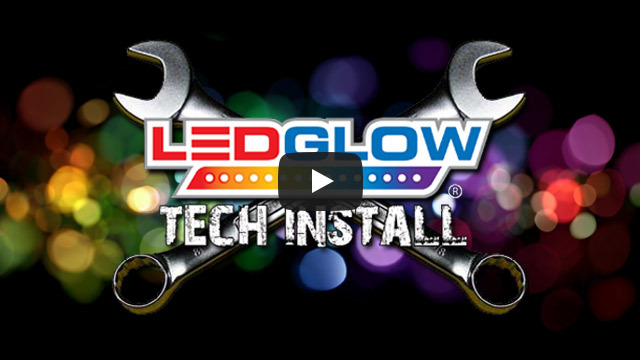 LEDGlow includes mounting hardware, installation instructions, free lifetime technical support and a one year limited warranty with each purchase. The control box features an interior tube add-on port located on the front of the control box that allows you to install up to (10) 12" interior tubes under the dashboard, under the seats or even in the trunk! Simply connect the interior tube junction cable to the control box, hook up the interior tubes and you're set! Adding the 24” grille light tube to your set up allows for the ultimate front end LED lighting that shines through the grille of your car! Simply install the grille light tube in the grille opening by attaching it to the bumper support or hood latch support. There is no extra wiring needed as it simply plugs into the underbody junction cable. Add up to (4) 24" flexible wheel well tubes to your underbody kit to finish off the underglow lighting. Install the wheel well tubes to the fender well to illuminate down on the tires or behind the strut to illuminate the rims. Simply connect the single color wheel well junction box to the underbody junction cable, hook up the wheel well lights and you're set! It took some labor, having never done it before it took only a bit of common sense. I am really sore from the installation process, but it was well worth the work. Just now have to be careful where I use them, they are illegal in the state of Idaho. But they turned out pretty nice. My 2015 Chevy Cruze hunter green looks dope with the green neon lights! I had no issues with install and product worked as described. Recommend to anyone wanting to light up your vehicle. Pretty great lights but I've dealt with better product. Just wish the instructions were layed out a bit better and had more descriptive pictures in them but besides that you get a quality product for a price you can't beat! Looks great! If you want high quality with easy install at a fair price, this kit is for you.